Remember me? I'm sure that I used to be a food blogger, once upon a time! This year has been completely crazy. I've started a new job and had so much going on, that Sun Sea & Sara has taken a bit of a back seat. Lots of food and adventures since you last saw me, that's for sure. I've been taking photos and posting up on Instagram, so hopefully I'll try and catch up on the blogging! It's worth the wait that you'll inevitably have for a table. They're still so busy that they're very often fully booked, and unfortunately I live just too far away to risk a walk in. However, I'd wait months (impatiently, granted) to get my hands on these Louisiana hot wings again. They have this addictive spicy, almost vinegary sauce on them and I can't get enough. I had them on both visits...and now I'm writing this again I'm off to book another table for a third batch. I'm trying so hard to describe how good these are, but you just have to try them for yourself. Whilst gesturing to everyone else on the table about how spicy and juicy they are, with hot sauce dribbling down your chin. I'm getting ahead of myself here though. Just in case you've been living in a cave for a couple of years and haven't bought any food from a truck recently, let me fill you in on the Hang Fire story (short version). Sam & Shauna are two awesome chicks who gave up their careers to eat their way around the US of A in search of the most badass barbecue and bring it back to Wales. They've really been the firing force behind the Cardiff street food movement, and still are. 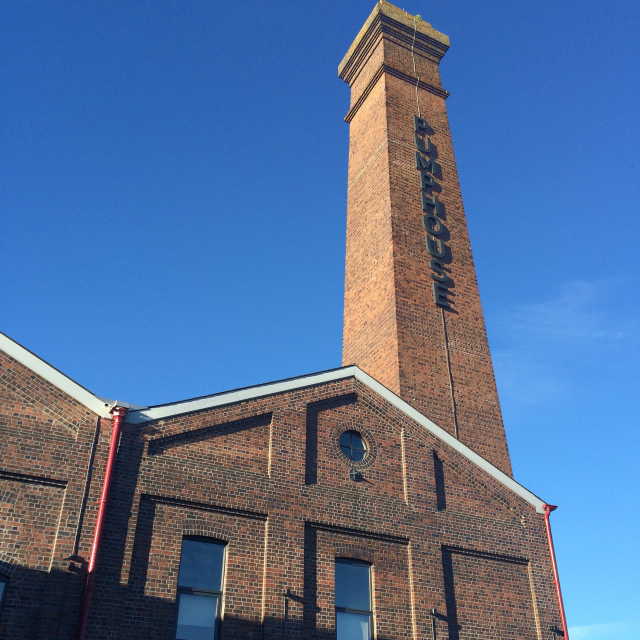 2016 has seen the opening of their first restaurant down the at the beautiful Barry waterfront, which is going from strength to strength, while still maintaining a presence on the street food scene. Number one rule on the day of your visit: Don't eat a thing all day. 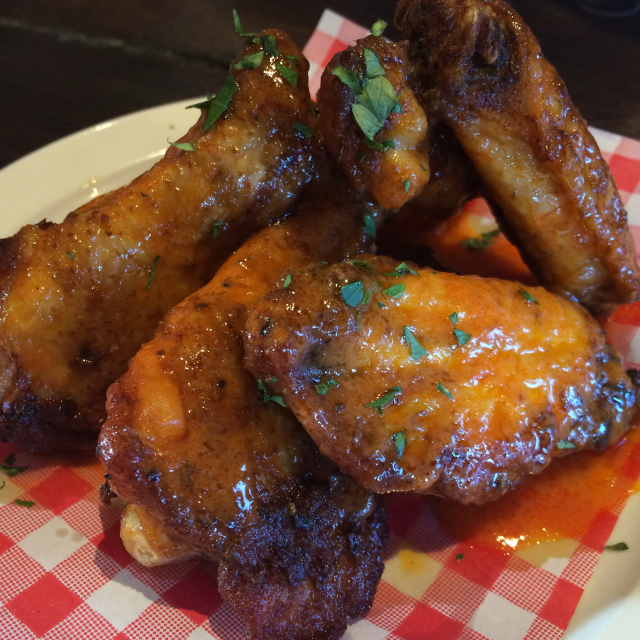 If you're going for starters, get the hot wings. I don't care about anything else. 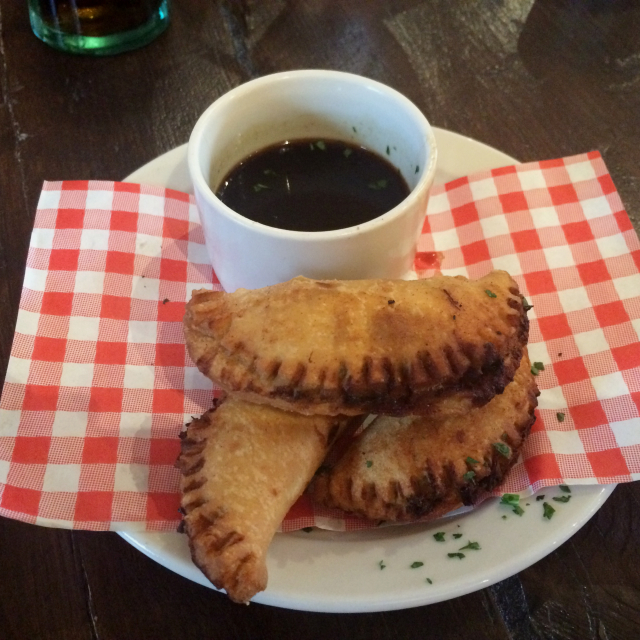 But if you're not feeling spicy, the lil cheeky pies are a cute plate to share. On my first visit, my friend and I (who is my equal in stomach filling ability) knew there was only one option. The Big Pit Plate. A sharing plate for two. Or should I say plates. 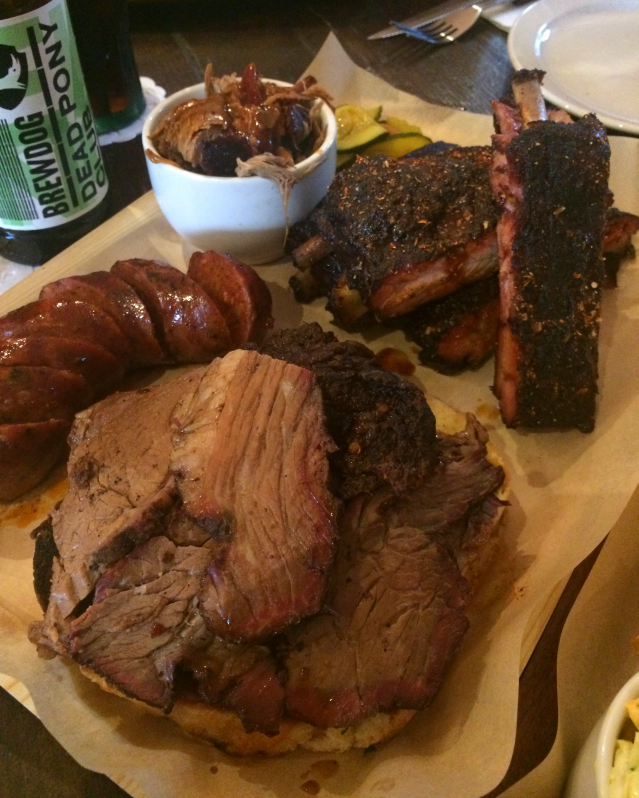 The meats: Brisket, St Louis ribs, Andouille sausage, Carolina style pulled pork. Oh and a little pot of glorious burnt ends and pickles. 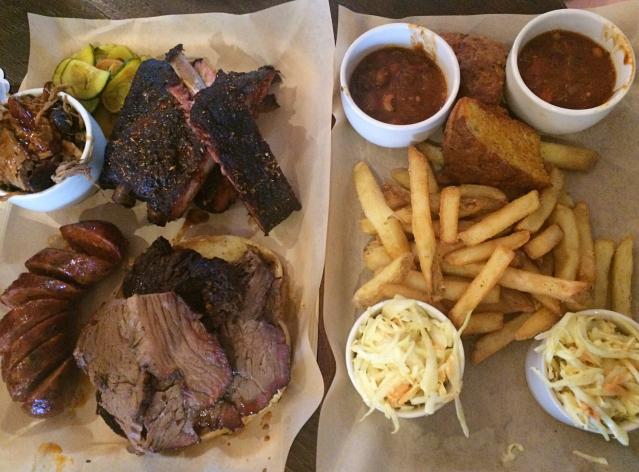 The Hang Fire ribs are indescribable if you haven't tried them yourself. Smoked low and slow the Hang Fire way, with the pink smoke ring and the dry rub on top. Melt in your mouth good, the meat just falls off the bone. Ditch the forks and get stuck in. Oh and the pulled pork. Oh and the brisket. Oh it's just all so good. 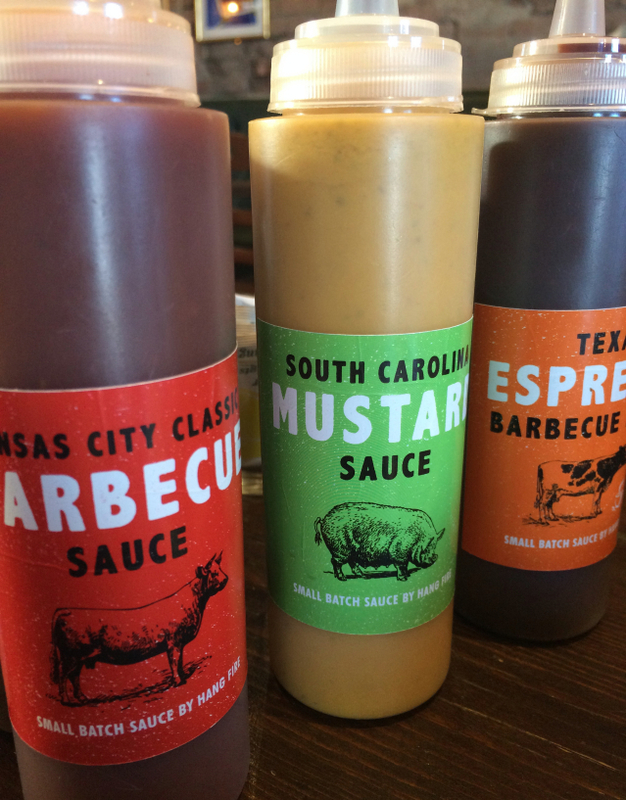 I might not have blogged in a while but I really am all out of words to describe this barbecue heaven that is HF. Just go and eat it all. Except those juicy burnt ends...they're mine. Prepare to fight your whole table over those. Nothing at HF is an afterthought. Even the carb tray was a fantastic mix of sides. 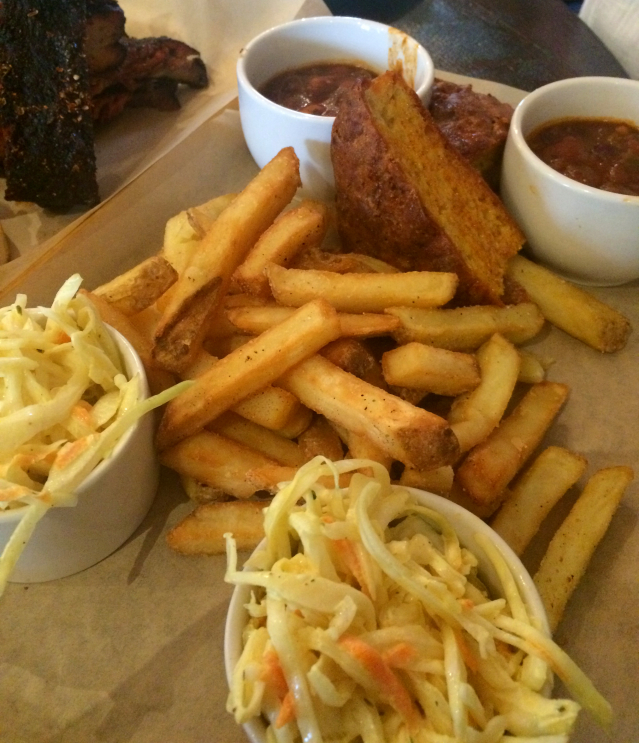 A pot of slaw and pit beans each, a slice of cornbread and perfect chips. The light and tangy coleslaw recipe is in their book (available on Amazon, but I got free with a £20 hug), I made it for a BBQ and even my mayonnaise obsessed friends and family loved it. It just goes so much better with the meat than the usual claggy stuff you buy in the shops. Even the sauces are made to their own recipe, the espresso sauce being my favourite drizzled on top of the chunky beef brisket. 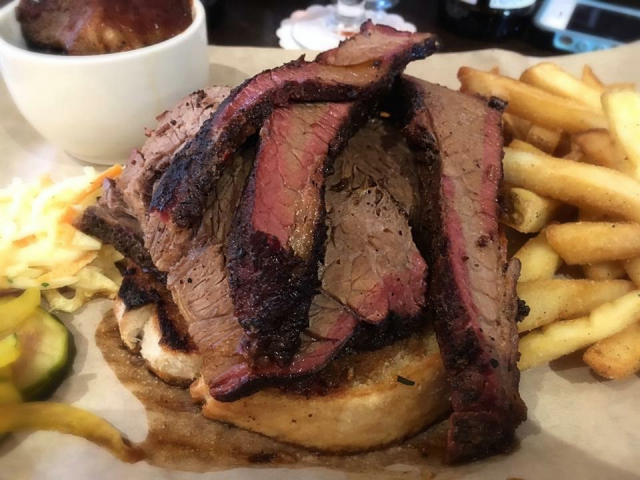 While us girls worked our way through the Pit Plate, the boys both went for the brisket. 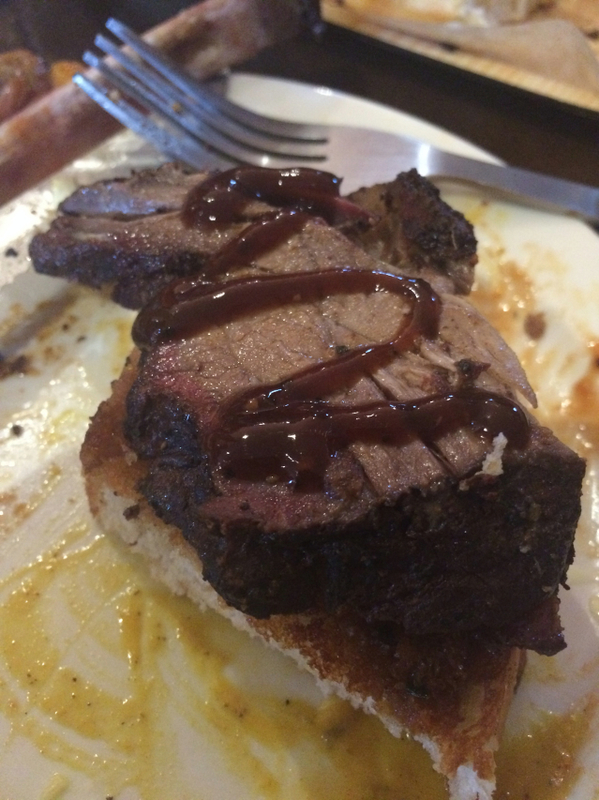 Complete with burnt ends and piled high on Texas toast (which I think is a slice of garlic bread to you and I). That ring of pink around the outside called the 'smoke ring' is a chemical reaction, and is the true sign of a low and slow smoking of the meat (which you won't find at certain "smokehouses" that pop up around town). Second time around, it was just Mr P and I on my birthday. I picked out the flat iron steak which comes with the dreamy chimichurri sauce and creamy bone marrow butter. 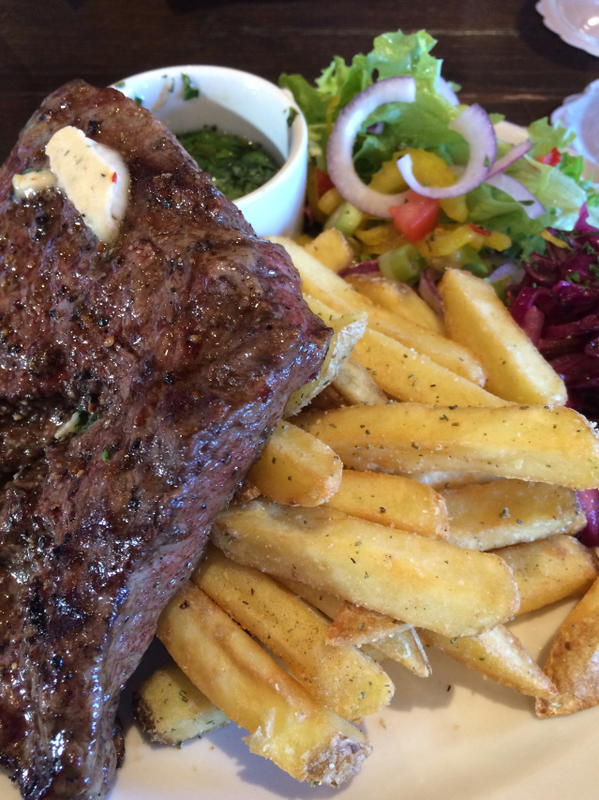 The steak was so thick yet cut like butter, and just melted in the mouth. Don't underestimate the chips either, I was still picking at these skin on beauties long after I'd run out of room. 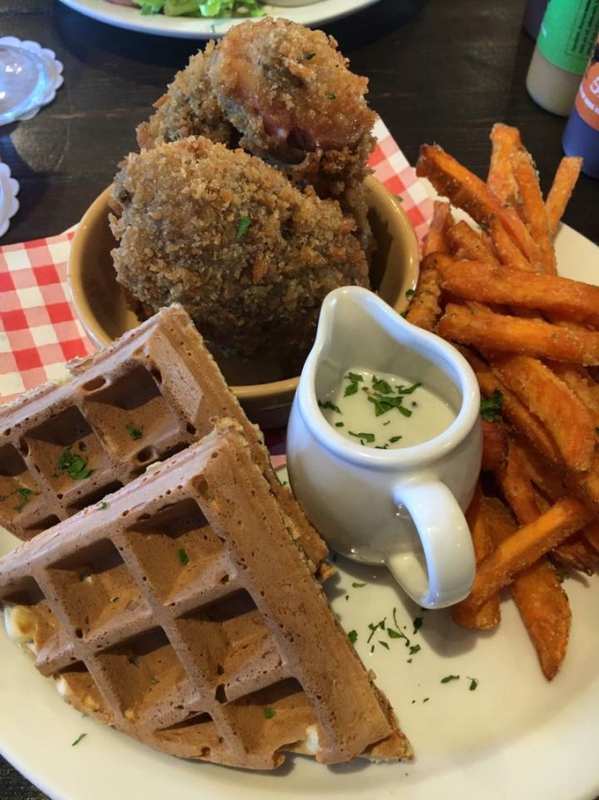 Mr P went for something he'd always wanted to try, that American classic of chicken and waffles, but with a sweet potato fry swap. The Hang Fire Southern Kitchen is everything I'd hoped for when I heard they had a restaurant. Aside from the utterly faultless food, the Pumphouse is beautiful and a Pinterest dream (check out the toilets). The staff are super friendly and there's just a good fun vibe about the place. Despite the fight to book a table, it's organised so that it never feels crowded. 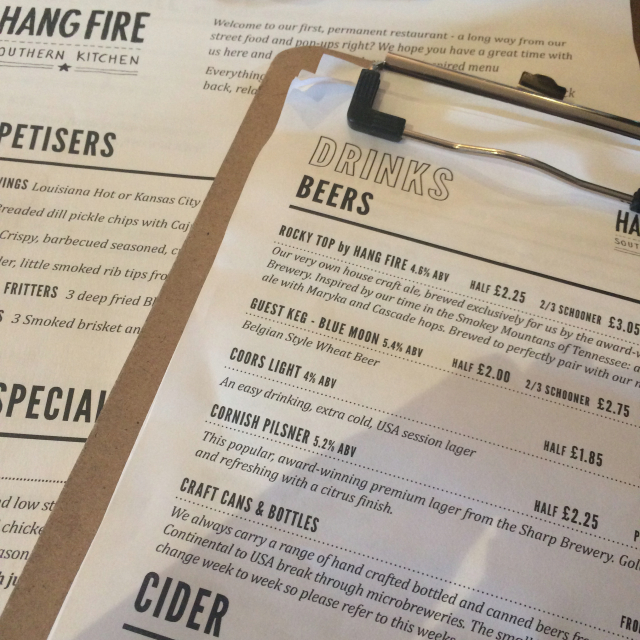 The drinks list is pretty hefty, with a good stock of craft beers such as Beavertown and Brewdog, which all go well with the food. Grab some friends, and go book a table now here! Don't forget to end with a pickleback!